I've been working full-time as a graphic designer for three years now – and if you include school, it's been seven. It really was God working behind the scenes that got me to decide to become a graphic designer. It isn't easy. As a career, it isn't easy. It's an insane challenge, with passionate clients and ever-changing computer programs. There's always more to learn and new ways to "think outside of the box." I'm not necessarily interested in being on the AIGA board someday, or being noted somewhere as the top designer of the year. But I am passionate about providing high quality content to my clients, alongside a customer service experience that is authentic and encouraging. It fires me up to hear their dreams, and I'm honored to be able to make those dreams become a reality. It proves to me over and over again that God can grab hold of every nook and cranny of your life and use it for His glory. What floors me further is that doing this pays our bills. 1. It’s how we make a living. Whether or not designing is our full-time job, it’s still how we feed our families. And typically, it’s not a casual hobby – it’s our career. Our work takes creative effort and time. We've either gone to school or spent hours of our personal time learning how to use complicated programs and how to use colors and shapes to create something both visually pleasing that also confidently expresses the mission of your brand. Whew. Pinterest and Instagram (and the internet in general) makes our jobs look fun. What's true is that while, yes, I truly enjoy my work, it's also a business – involving contracts, research, four years of schooling, two years of internships, and lots of time. 2. You pay your mechanic. Just like you pay someone to fix your car when it breaks down, you should pay a designer to create (or "refresh") your logo. Design is a service that requires time and effort, just like any other service out there. You also pay for what you get. It may seem that everyone who has an iPhone can be a photographer, but that's really not true. The internet has made it easier than ever for more people to join the creative industry (which has certainly been a huge benefit to myself and many of my friends!) but it can also be deceiving. We come across beautiful homes, branding, websites, and imagery every day on the internet, thousands of times a day. It feels like it should be free or easy. The truth is that high-quality, professional, and reliable service from someone with experience comes with an appropriate price tag... and there are risks when you get it for cheap. 3. Most “quick tweaks” are not quick. “It will be easy, you can knock it out quickly.” This is often assumed, and while sometimes it's true, more often it's not. Like I stated above – we've gone to school for this. We've studied hard and done our research. We draw out hundreds of ideas. If you're looking for something high quality, it will take time and that time is worth something. 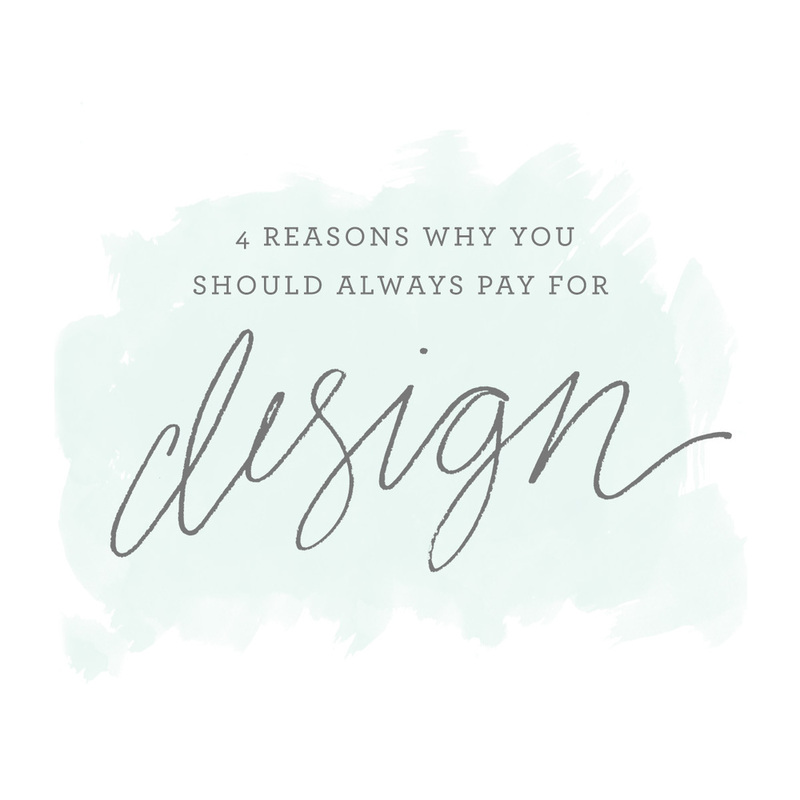 A trustworthy, talented designer will die a little inside if you ask them to “just whip something together, it doesn’t have to be that great.” That's the equivalent of asking us to only do half of what we know how and love to do... we would rather provide you something quality that truly speaks to what your needs are. Let us do that for you. 4. You take away our chance to be generous. I know some awesome graphic designers (myself included) who donate their skills regularly. But that is 100% their decision. They are the one that makes the sacrifice of their time and effort... thus, they're the one that gives the gift. If you force it on them, it removes their opportunity to give that gift. Tell us what your budget is up front. We can easily set up a payment plan or trade skills (I love when it goes this way). And, depending on the situation, we'd might gift you with a discount or take on your project free of charge. I could probably create a much longer list and I know other designers who could easily add to this. This does not mean that we are angry perfectionists! We are just human beings trying to do our job well. Our families are important to us, and that means our work should sustain them. That's being responsible. So... what do you do if you honestly don’t have the money and you need something done? Like I stated above, I know my friends and I would be more than happy to trade services. Think of things you are good at, or something you enjoy doing. For simple design or photography requests, I've had people take Chris and I to dinner (we love that – we get the added bonus of actually spending time with you). And for many artists in the wedding industry, exposure can be an great thing to offer – when offered responsibly and honestly. Do your research. If you don't have a written, signed contract with a publisher saying they will share your styled shoot, etc. then do not offer only exposure as your payment. Go ahead and pay your artists for their effort, even if it's just a small fee. If they're as excited as you are for the possibility of being published, they might come back to you and say they'll do it for free! I spent the past year doing several projects for free because I gave it as a gift. At the same time, I’ve also learned how to responsibly and appropriately charge for what I do. It's an exciting process, and really... when you pay for something, you're so much more invested in it yourself. Your dreams and business become real when you put a price tag on it. You're becoming a person of commitment and responsibility when you do that, and that's an incredible thing. Good design heightens the look of your brand or event. It will be inviting and approachable, attracting more people to what you're doing. It gives you something confident and timeless that you can use for many years. It's something that viewers can use as an identifier of your brand or event. Good design has a price tag because it's worth it. Regardless of your career, has anyone ever tried to ask you to pursue your craft for free? Jan 14 Blogging Basics are Back!